On the horizontal level one other institution comes into view when discussing the various spheres of responsibility with which the child comes into contact, and that is the school. A Christian school is given its responsibility by the parents and community that established it. This responsibility flows from the parents/community to the board, principal, and teacher. A public school is given its mandate from the provincial government and the voters. The ballot containing the names of candidates for mayor and councillors will also present names for candidate school trustees. Because the public school is not parent run, as the Christian school is, parents have little recourse to effect change at the public school. When the government introduces antichristian curricula and demands (cf, what is presently happening in Alberta) the parents have little recourse, other than on election day. But let us continue speaking of how it is at the Christian school. What is the responsibility of the school towards the child? What is the place of the school in light of the biblical principle that God gives parents the task to raise the children that he gives them? We ought not to identify Christian education with Christian schools. Christian education is bigger than the Christian school. If parents leave all the education of their children to the schools, then the children, the families, the churches, and the schools will be frustrated. The school is part of the picture, but not the total picture. And the parents' role must remain primary, also in the instruction of their children. Since it is primarily the task of parents to train their children it makes sense that the parents, and the broader community of the church, will band together to establish a school, form a board, and hire a principal and teachers to help them fulfill their task. 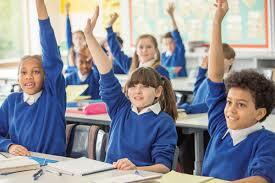 Parents may opt either to home school or to establish a day school. Since the education of the children is of greatest importance, it is essential for church, home, and school all to be pulling in the same direction. The image of a triangle is well known and useful: church, home, and school form a triangle where all seek equally and cooperatively to train the child in a biblical way. Your children are the only “things” you have been given that will last for ever. Everything else you have is borrowed stuff which will all burn on the last day, but your children will live for ever, either in heaven or hell. Raise them carefully! If the community of Reformed churches and believers at all have the possibility they will establish a confessionally Reformed school. Teachers, who have the children in their classrooms for many hours per day, will significantly impact the children, for good or for ill. For that reason parents, through the board, will be careful when hiring teachers. The purpose and goal of the school is to teach the students, to impart to them knowledge, and to help them develop skills that they may become better citizens of the kingdom of God and of the country in which they live. It is the task of parents and of the church to lead the little ones to Christ, and the teacher will help the parents and the church pursue that goal. Reformed parents send their children to a (Reformed) Christian school in order for the children to receive good academic instruction in all the necessary disciplines by well-trained teachers who are unequivocally committed to the Reformed faith and who will strive to teach the students from within the framework of a Biblical (i.e., Reformed) view of God, man, and creation. As Reformed confessors we want the teachers of our schools to know and to love the Reformed confessions, and to teach our children from that perspective. The goal of the school ought to be to impart to the student knowledge and skills within the framework of a consistently Reformed view of God, man and creation. We want the school to train our children to live in this world able to use their God-given talents to the glory of God and the well-being of the neighbour. 1. The child belongs to the parents. God calls parents to take care of every aspect of their children's lives—physical, spiritual, moral, ethical, social, educational. This is the divine calling of parents. 2. The church also has a divine calling towards the children. The children are lambs of the flock. The church must care for them and teach them. 3. Reformed believers who are members of Reformed churches will want to establish confessionally Reformed schools. They will want their children taught by teachers who stand with them foursquare on the Reformed faith as it is confessed in the Reformed standards. c. Be well-trained and academically up-to-date. May God bless Reformed Christian parents everywhere in the world. May God bless all the schools that they, with the help of their church communities, establish. The government of the Province of Alberta is demanding ungodly principles and actions of all the schools in the province. Schools that do not comply with the demands of the ministry of education may lose both any funding they receive and accreditation. The latter is worse than losing funding because graduates would not be able to pursue post-secondary education. Their diplomas would not be recognized by colleges or universities. There may be a task here for the Justice Centre for Constitutional Freedoms and/or the Association for Reformed PoliticalAction. Abbreviated version of conclusion of speech delivered at CRTA--West Teachers' Conference in Coaldale, Alberta, March 22, 1996.